There was widespread disobedience to the Fugitive Slave Act of 1850, which enlisted the powers of the national government to return escaped slaves to their masters. Blacks and whites joined in armed resistance. When they were arrested, it often happened that juries, defying the Fugitive Slave Act themselves, would acquit them. In Boston, for instance, in 1851, a man named Shadrack was rescued from a courtroom by 50 blacks, eight of whom were tried and acquitted. That same year, the escaped slave Jerry was rescued from a police station in Syracuse. Eighteen men were indicted, all were acquitted. In 1854, President Franklin Pierce dispatched federal troops, joined by state militia and local police, to capture Anthony Burns, a slave who had escaped to Massachusetts from Virginia. Citing the Fugitive Slave Act, on May 27, 1854, Commissioner Edward G. Loring ordered Burns be returned to slavery in Virginia. The night before, black and white abolitionists used a battering ram against the courthouse doors but were repulsed. On June 2, Burns was marched to the waterfront, through streets draped with black cloth and lined with thousands of his supporters, to the sound of church bells toiling, and was forcibly sent back to slavery. On the eve of Bums's sentencing, the Unitarian abolitionist minister Theodore Parker, a supporter of the rebel John Brown, gave this rousing address1 to a packed meeting house in Boston. That night thirteen people were arrested and one marshal killed. Slavery tramples on the Constitution; it treads down State rights. Where are the rights of Massachusetts? A Fugitive Slave Law Commissioner has got them all in his pocket. Where is the trial by jury? Watson Freeman has it under his Marshals staff. Where is the great right of personal replevin [a legal remedy in which a court requires the return of specific goods], which our fathers wrested, several hundred years ago, from the tyrants who once lorded it over Great Britain? Judge [Peleg] Sprague trod it under his feet! Where is the sacred right of habeas corpus? Deputy Marshal Riley can crush it in his hands, and Boston does not say anything against it. Where are the laws of Massachusetts forbidding state edifices to be used as prisons for the incarceration of fugitives? They, too, are trampled under foot. "Slavery is a finality." These men came from Virginia to kidnap a man here. Once, this was Boston; now, it is a northern suburb of Alexandria. At first, when they carried a fugitive slave from Boston, they thought it was a difficult thing to do it. They had to get a Mayor to help them; they bad to put chains round the Court House; they bad to call out the "Sims' Brigade"; it took nine days to do it. Now, they are so confident that we are subjects of Virginia that they do not even put chains round the Court House; the police have nothing to do with it. I was told, today, that one of the officers of the city said to twenty-eight policemen, if any man in the employment of the city meddles in this business, he will be discharged from service without a hearing [great applause]. Well, gentlemen, how do you think they received that declaration? They shouted, and hurrahed, and gave three cheers [renewed applause]. My friend here would not have the honor of presiding over you tonight, if application had been made a little sooner to the Mayor. Another gentleman told me that, when he was asked to preside at this meeting, he said that he regretted that all his time tonight was previously engaged. If he had known it earlier, he said, he might have been able to make arrangements to preside. When the man was arrested, he told the Marshal he regretted it, and that his sympathies were wholly with the slave [loud applause]. Fellow-citizens, remember that word. Hold Your Mayor to it, and let it be seen that he has got a background, and a foreground, which will authorize him to repeat that word in public, and act it out in Faneuil Hall. I say, so confident are the slave agents now that they can carry off their slave, in the day-time, that they do not put chains round the Court House; they have got no soldiers billeted in Faneuil Hall, as in 1851. They think they can carry this man off tomorrow morning in a cab [voices—"they can't do it"—"let's see them try"]. I say, there are two great laws in this country. One is the slave law: that is the law of the President of the United States; it is Senator [Stephen A.] Douglas's law; it is the law of the Supreme Court of the United States; it is the law of the Commissioner; it is the law of every Marshal, and of every meanest ruffian whom the Marshal hires to execute his behests. There is another law, which my friend, Mr. [Wendell] Phillips, has described in language such as I cannot equal, and therefore shall not try; I only state it in its plainest terms. It is the law of the people, when they are sure they are right and determined to go ahead [cheers]. Now, gentlemen, there was a Boston once, and you and I had fathers—brave fathers; and mothers who stirred up those fathers to manly deeds. Well, gentlemen, once it came to pass that the British Parliament enacted a "law"—they called it a law—issuing stamps here. What did your fathers do on that occasion? They said, in the language of Algernon Sydney, quoted in your resolutions, "That which is not just is not law, and that which is not law ought not to be obeyed" [cheers]. They did not obey the stamp act. They did not call it a law, and the man that did call it a law here, eighty years ago, would have had a very warm coat of tar and feathers on him. They called it an "act," and they took the Commissioner who was here to execute it, took him solemnly, manfully,—they didn't harm a hair of his head, they were non-resistants of a very potent sort [laughter],—and made him take a solemn oath that he would not issue a single stamp. He was brother-in-law of the Governor of the State, the servant of a royal master, exceedingly respectable, of great wealth, and once very popular; but they took him, and made him swear not to execute his commission; and he kept his oath, and the stamp act went to its own place, and you know what that was [cheers]. That was an instance of the people going behind a wicked law to enact absolute justice into their justice, and making it common law. You know what they did with the tea. Well, gentlemen, in the South there is a public opinion (it is a very wicked public opinion), which is stronger than law. When a colored seaman goes to Charleston from Boston, he is clapped instantly into jail, and kept there until the vessel is ready to sail, and the Boston merchant or master must pay the bill, and the Boston black man must feel the smart. That is a wicked example, set by the State of South Carolina. When Mr. [Samuel] Hoar, one of our most honored and respected fellow-citizens, was sent to Charleston, to test the legality of this iniquitous law, the citizens of Charleston ordered him off the premises, and he was glad to escape, to save himself from further insult. There was no violence, no guns fired. This is an instance of the strength of public opinion—of a most unjust and iniquitous public opinion. Well, gentlemen, I say there is one law—slave law; it is everywhere. There is another law, which also is a finality; and that law, it is in your hands and your arms, and you can put that in execution just when you see fit. gentlemen, I am a clergyman and a man of peace; I love peace. But there is a means, and there is an end; liberty is the end, and sometimes peace is not the means cowards it [applause]. Now I want to ask you what you are going to do [a voice—"shoot, shoot"]. There are ways of managing this matter, without shooting anybody. Be sure that these men who have kidnapped a man in Boston are cowards, every mothers son of them; and, if we stand up there resolutely, and declare that this man shall not go out of the city of Boston, without shooting a gun—[cries of "that's it," and great applause],—then he wont go back. Now, I am going to propose that when you adjourn, it be to meet in Court Square tomorrow morning at 9 o'clock. As many as are in favor of that motion will raise their hands [a large number of hands were raised, but many voices cried out, "Let's go tonight," "let's pay a visit to the slave-catchers at the Revere House," etc., etc]. Do you propose to go to the Revere House tonight? then show your hands [some hands were held up]. It is not a vote. We shall meet in Court Square at 9 o'clock tomorrow morning. 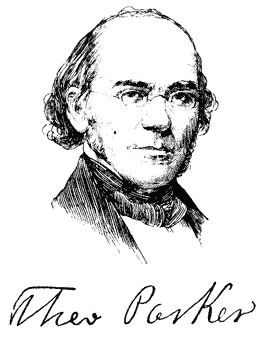 1 Reverend Theodore Parker, "Speech of Theodore Parker at the Faneuii Hall Meeting" (May26,1854). In Charles Emery Stevens, Anthony Burns: A History (Boston: John P. Jewett and Company, 1856), pp. 289-95.